This entry was posted in Uncategorized and tagged Bigfoot, Feet, Foot, New Balance, Shoe, Shoes, Size by christao408. Bookmark the permalink. Glad you found good shoes! Makes me wonder, though… how much do we (I) go along with, thinking that it’s right… when really, if we stopped to do something about it – we would discover something totally different? Thanks for sharing your “foot secret” with us. I agree New Balance makes the most comfortable sneakers. The stores in Bangkok do not carry NB? (Probably your size is out of the range in stock). I find this a tad odd- how can you not realize that the shoes don’t fit you proper and not try the next size?! Anyway, glad you found comfort for your feet- even if two decades late! You think you got problems. I wear a size 14 ! @Dezinerdreams – I know, I know… but the answer is actually not too surprising. If I found the 10.5 2E a bit tight and tried a 11.0 2E, it would feel a little long but still not any wider. Few stores regularly carry a 4E, though, so it had never crossed my mind to increase the size both longer and wider. Plus, I did find some shoes in 10.5 2E that were comfortable enough that I thought it was a matter of variation from manufacturer to manufacturer. @CurryPuffy – There are two New Balance locations here in Bangkok and while they do have a few shoes in 2E, they have none in 4E. They might be able to order for me, though. But at this point I have plenty of NB shoes; now I need some dress shoes that are wider. @Passionflwr86 – That’s a good question. Over time, we assume that “that’s just the way it is” until we one day discover that it can be different. @The_Eyes_Of_A_Painter – Yikes! Regular width (D) or wider? @christao408 – Neither. My feet are long and slim. 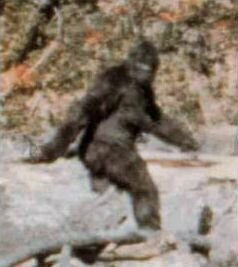 As a boy I had a real tough time finding shoes. Fortunately in my city there are a few stores that carry my size. Good thing about it, they are the Italian brands. 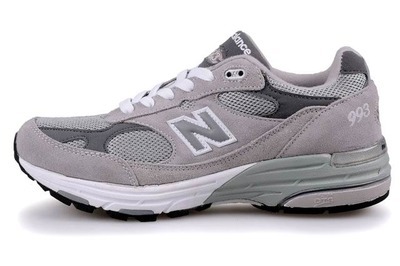 I wear the style 993 too. I used to sell shoes so I know what it means to find the correct shoes. Hehe. I’m just dumbfounded. As a woman – I measure my feet every chance I get. I went up 2 sizes with pregnancy, lost size after weight loss… currently I’m at a 7.5 D width… when I was in college I was size 6 B… things change – I’m just surprised that you delayed so long!! ps – you do not have “big” feet as all the men in my house wear size 11 – 12. @christao408 – So complicated! Btw, you live in Bangkok- it’s time you got some shoes custom made! I’m about a 10.5-11 in size too! You’re not alone! @Roadlesstaken – I think people with big feet are prolific bloggers. I wear New Balance too. It’s wide and perfect for those of us who need to wear orthotics. hahaha maybe you are too used to living around people with smaller feet, so such large shoes aren’t readily available? My son Sayeed wears a 12 or 13 depending on the make. He has similar problems, and is extremely choosy about his sports shoes since he plays tennis and golf. I have seen him discard brand new shoes after bringing them home and trying them at home for an hour or so. Now he has them perfect, he says. Not sure if decided to measure his feet too.I am so glad you finally found a solution Chris. My sympathies Chris. I have what I affectionately call “duck feet” Big and wide with short toes. Women’s shoes don’t usually come in my size. 10.5 EE. Most shoes have half sizes all the way to 9.5 and then 10, 11 etc.With my wide feet, I feel ya their kiddo, adding length doesn’t do any good. The shoes never feel right. Good Feet store and New Balance have been fabulous. Isn’t that just the truth: “how much comfort a professional shoe salesperson can bring to another human being.”Glad to hear there Chris!!! 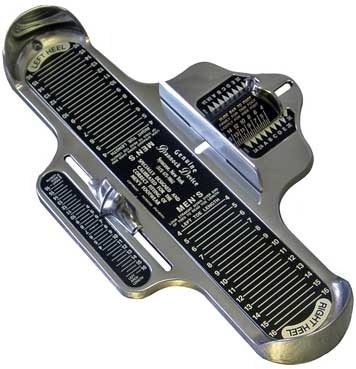 I haven’t see one of those foot measuring thingys since I was a kid nor have I seen a salesperson who actually helps me decide whether the shoe fits or not. I’m lucky if I can get someone to get the box down from that top shelf for me. Same goes for bras. You are lucky you don’t need one of those! @Roadlesstaken – So proportionately, your feet are bigger than mine. Interesting…@nurseynursey – Well, unless I start exercising more regularly, I might end up in the market for those, too. Ha ha! @yang1815 – I should probably write his boss and tell him, huh? @christao408 – That would certainly be nice!